It would be an understatement to say that Megan and I were surprised (stunned is probably a more accurate description) when Skip e-mailed us several months ago, asking if we would be willing to present our reef tank as a "Tank of the Month" on Reef Central. 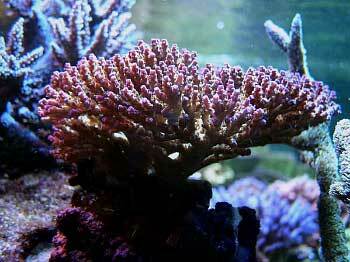 Although we have kept some sort of reef tank for a little more than six years, we still consider ourselves relative beginners-that is, hobbyists who too often continue to learn the hard way by making mistakes that, in retrospect, could (and should) have been prevented. It is thus a great honor-as well as a little daunting-to have our tank included among the group of truly extraordinary tanks that this forum has featured over the past several years. 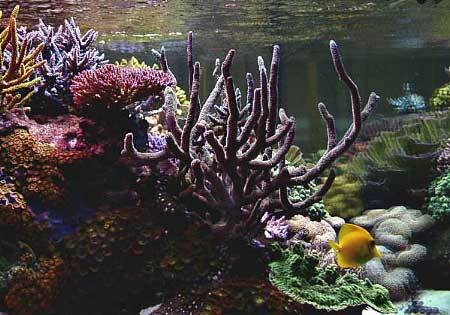 Like many in the hobby we began "small"-in our case with a 30-gallon glass tank-after seeing what seemed to us an unbelievably beautiful saltwater reef tank in a local store in Eugene, Oregon. 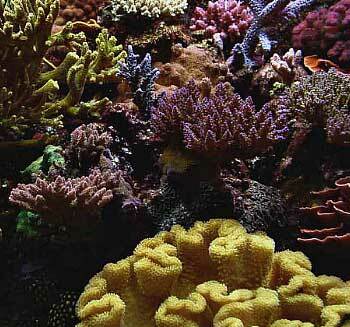 Although almost all of the information we were given about setting up that first tank was wrong (inadequate lights, a "Skilter" filter, and so on), we persevered, read a lot of books, asked a lot of questions, and eventually established a fairly successful soft coral tank. About a year and a half later we upgraded to a 120-gallon acrylic tank using metal halides (175-watt at first, later changing to 400-watt bulbs), VHO fluorescents, a sump, and an AquaMedic Turboflotor skimmer. 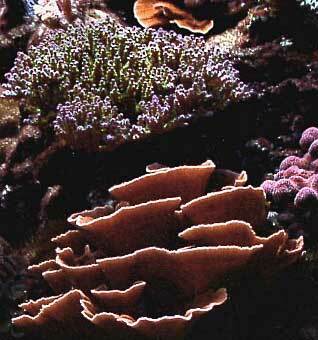 At that point, we began to try our hand with SPS corals, and then gradually moved more and more in that direction. Two years later we purchased and set up our current tank, which is now about 2 ½ years old and has suffered two serious setbacks: a four-day power outage less than six months after it was established (we have since bought a generator), and, more recently, an episode in which I "burned" many of our SPS colonies by introducing carbon for the first time in a ten-month period, thereby rapidly increasing the intensity and/or spectrum of light penetrating the water. 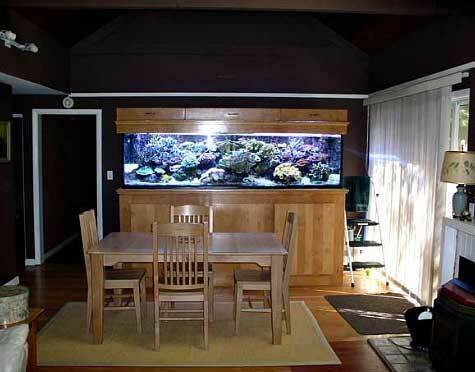 The tank is standard glass, manufactured to our specifications for a very reasonable price by Sea Star Aquarium Products, a small company located in Victoria, British Columbia. It measures 96"L x 33"W x 24"H, and has standard 5/8" glass sides and a 1" thick glass bottom made from two ½" thick pieces laminated together. 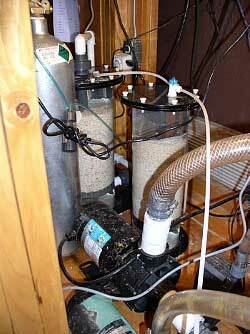 It uses two overflows, each of which has two 1 ½" drains. The overflows are placed 9" from each end of the tank, and are shaped like trapezoids rather than rectangles. Thus, the side panels of each overflow intersect the back of the tank at a 45° angle. This makes them less noticeable from the tank's sides. The total volume of the tank is 340 gallons. 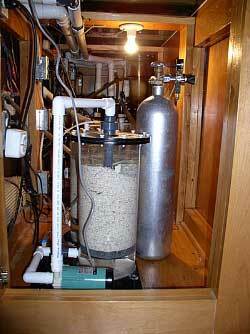 We also use a 60-gallon acrylic sump, which I made. 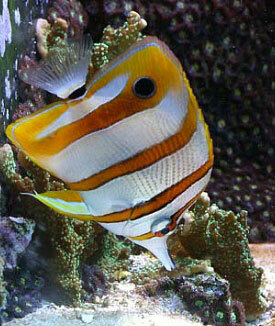 Although we don't have a refugium, we would like to install one if we can find room for it. Overall, we are very happy with the quality and dimensions of the tank. Although the extra depth makes it difficult to reach the back, especially in the middle, where there is a 17" brace, it allows a great deal of flexibility in aquascaping-a priority for us. If we did it again, we would likely try to find a design that avoided using such a large brace in the middle. Ideally, we would also have access to the tank from the back, but because of our home's floor plan arrangement, that is simply not possible. I built these myself. The main supports for the stand are 2"x6" studs, which are sheathed in alder. It is taller than many stands, since the tank's bottom is 44" above the floor, and it has three doors in the front and one at each end. The hood has three doors and is built mostly of ¾" plywood, which I then covered with an alder veneer. The return pump is a Dolphin AquaSea 4700. It feeds two modified 1" Sea Swirl return lines located on the back of the tank. By my calculations, a bit more than 1500 gph flow through each of the Sea Swirls. Two Gemini pumps, located in the rear corners of the tank, pump approximately 1000 gph each, for a total flow of 5000+ gph. We find the motion created by the Sea Swirls very beneficial, and-until recently-this has been enough flow for the tank. 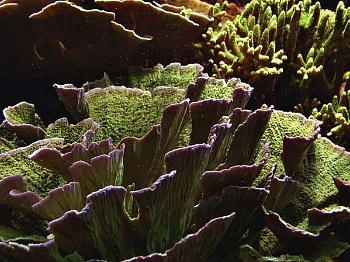 As the corals continue to grow, however, we have begun to find some "dead spots" and are thinking of adding more current, perhaps by installing some sort of closed loop system. Our skimmer is a Precision Marine Bullet 3, powered by an Iwaki 55RLT. We also have a very large MyReef Calcium Reactor, with 8"x18" and 6"x18" reactor tubes, as well as a MyReef Nilsen Reactor. Up until about six months ago, we added calcium and raised alkalinity with an MTC Pro-Cal, but that reactor, as terrific as it is, eventually was unable to keep up with the tank's alkalinity and calcium demands. We have been mostly pleased with all of these items, although I have made a couple of modifications to the MyReef calcium reactor. We also use carbon continuously. There are five heaters in use on the system--all of them Ebo-Jager. 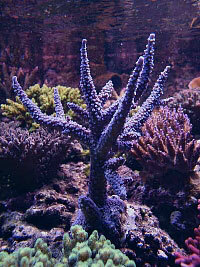 We have no pH monitor, ORP monitor, or any other controllers. We use four 400 watt 20K Radium bulbs, (over)driven by PFO HQI ballasts, and six 110 watt VHO bulbs (four actinics and two Aquasuns), powered by both an IceCap and an ARO ballast. The bulbs are arranged, from front to back: actinic, Radium, actinic, and Aquasun. In the past we have used both 65K and 10K 400-watt halides with two more actinics, but, to our eyes, our present combination is the best choice aesthetically. 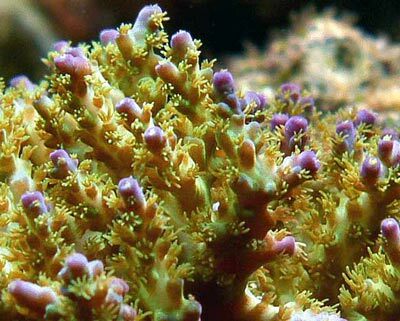 The corals may not grow as fast with the Radiums as with, say, 65K bulbs (although ours certainly seem to grow quickly enough), but at this point growth isn't important to us; in fact, more often than not, it's a problem. We replace all of the bulbs every six months at staggered intervals. The temperature hovers around 82° F for most of the year and gets as high as 86° F during the summer. We do use a small chiller to keep it from going above 87° F. Our calcium level is typically around 420 ppm, and the alkalinity is usually about 10-12 dKH. I don't check pH very often, but it is typically 8.1-8.3. Indeed, I don't check many of these parameters very often any more. 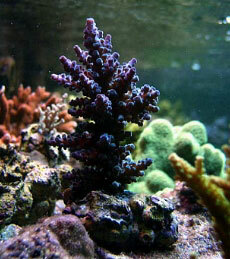 We use no additives regularly, and make infrequent water changes. About four gallons of water evaporates from the tank each day. We use RO water, without a deionizer, for all top-off and makeup water. 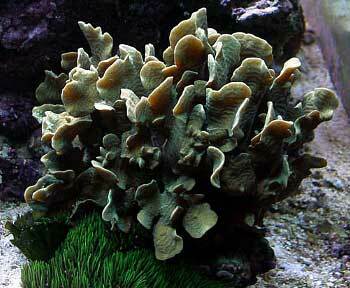 We tried to avoid as much as possible aquascaping our "reef" to look like a solid wall. The 33" width proved beneficial in this regard, since it gives the tank a sense of depth that would be difficult to achieve in a 24" wide tank. 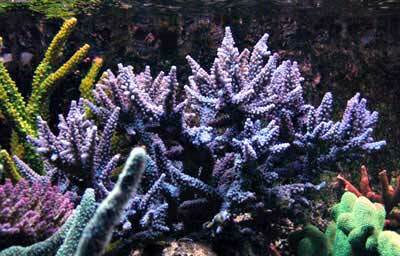 Our tank contains less live rock (approximately 300 lbs. total) than most other tanks its size, and we placed much of the rock on a PVC frame, so that the entire left side of the tank forms a large cavern in which the fish and other critters can hide. We have also built several "canyons" running front to back. Approximately 700 lbs. of sand cover the tank's bottom-about two-thirds aragonite (mostly Southdown) and one-third "Oregon Beach Sand," a silica based sand that I purchased at a local garden supply (and which has not caused any problems, despite some dire warnings). The depth of the sand is quite low (1-2") at the front and gradually rises to 8"+ in the back. This was not our intention, although we like the effect quite a bit; in this case, the Sea Swirls did the aquascaping for us. 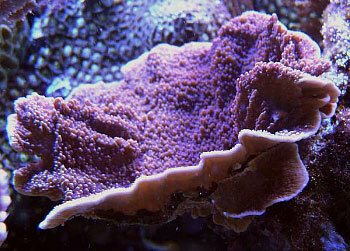 Similarly, the presence of the large brown plating Montipora dominating the back center of the tank resulted from our inability to retrieve the 3" piece of that coral, which we had purchased locally and placed in the back center "temporarily" to see if it would brighten up. Well, it didn't, but by the time we recognized that it would stay brown, we couldn't remove it without breaking it. So we left it; it grew like the plant in Little Shop of Horrors, and we have actually become quite pleased with how well it fits into the overall arrangement of the tank. The maintenance chores involve cleaning the front glass every other day or so and occasionally making sure the notches in the overflows stay as clear as possible by removing some Bryopsis that tends to grow there. 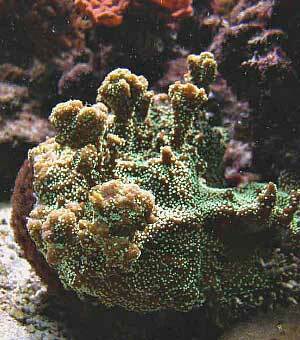 The carbon is changed out roughly every six weeks, and the skimmer is usually cleaned on a bi-weekly basis. I clean the bottom of the 17" center brace about once per month with a straight razor, as it tends to accumulate a thin haze, and I also wipe the halides and VHO bulbs whenever they need it due to salt spray build up. As I mentioned, we don't have a strict regime of regular water changes, although we're hoping to get into some sort of routine in the not too distant future, possibly changing about 30 gallons per month. 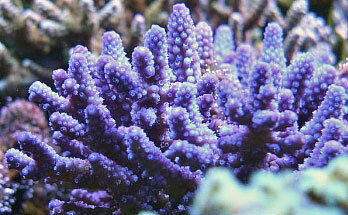 SPS corals dominate the tank, but it also contains a fair number of various polyps and a couple of large soft corals. 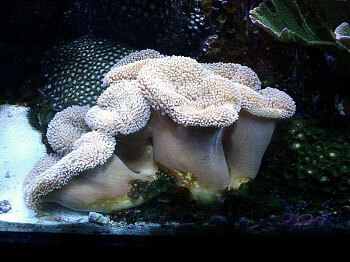 We didn't introduce any of the polyps; they simply appeared gradually as hitchhikers on the live rock we ordered from Premium Aquatics for our 120-gallon tank-as did the large Porites lobata adjacent to the Sea Swirl, on the right as you face the tank. 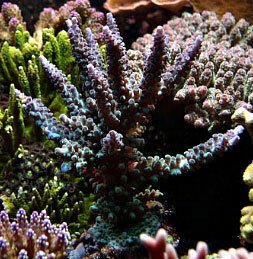 Most of the SPS corals started as fragments or aquacultured corals, including the large Montipora capricornis in the center (which is about 14" tall and 17" wide and was even larger until I inadvertently broke off some of its outer layers with a magnet) and the green staghorn next to it. 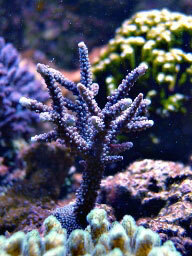 At this point, we have virtually run out of room in the tank, so any coral we add must be balanced by removing one. 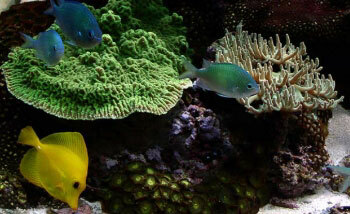 Currently, our tank is home to nine green chromis, a three-striped damsel, a copperband butterfly, a flame hawk, and three tangs (a purple, a yellow, and a clown). 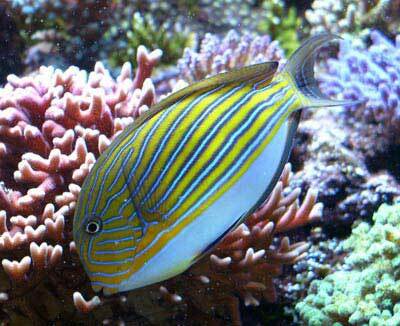 The clown tang, which is very impressive but also extremely territorial, is the dominant inhabitant, and his dominance makes it difficult for us to add additional fish. 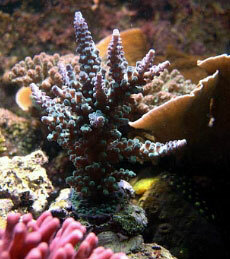 We feed somewhat heavily, alternating daily between spirulina, small VibraGro pellets, and brine shrimp. 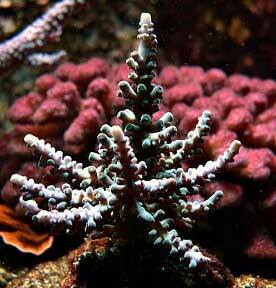 We have several brittle stars, quite a few very small white Asterina sp. starfish (these have only been around for the past year or so and they don't seem to bother anything), lots of worms, assorted amphipods and copepods in the sand, several conchs, and a mixed variety of snails. We have only one hermit crab, since we stopped adding them to the tank more than a year ago. 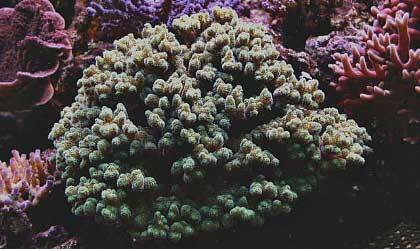 There are, however, lots of commensal crabs in the corals, as well as some very large furry types, which we usually see only at night, and which apparently came in to the tank as hitchhikers on the live rock or corals. That's all the information that comes to mind at the moment. 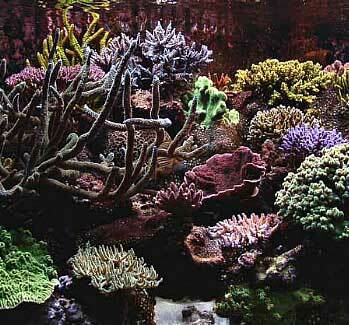 Thanks again to Skip and the Reef Central crew for graciously featuring our reef tank. I'll be happy to answer any questions, either on the board or through email.